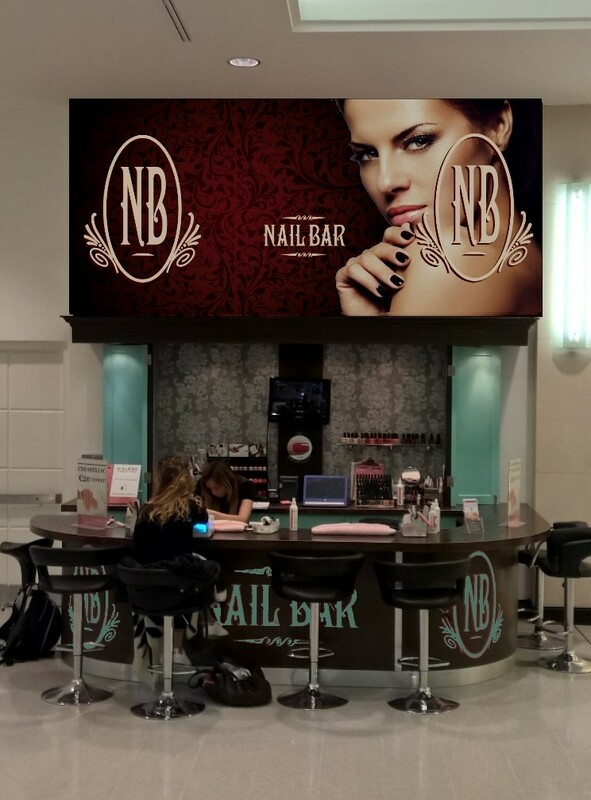 Welcome To Nail Bar Jervis! Introducing New 14-day Gel Polish from the Manicure Company! Check back every Sunday for our weekly special offers. Our Early Bird Offer has been extended to the end of Summer! It's simple; every day we offer 20% off all* treatments started by 11:30am!!! Get your Shellac nails done ALL DAY on Tuesday for ONLY €20! Appointments fill up quickly so book early. (Optional French or Shellac removal - €3 extra each). 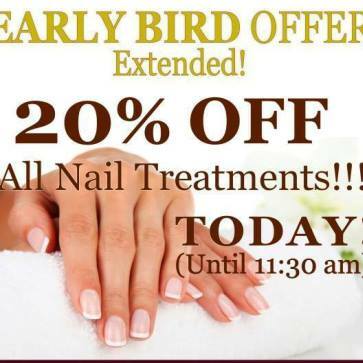 Daily: 20% Early Bird Offer - 20% off all treatments started before 11:30am everyday (exclduing gel refills). 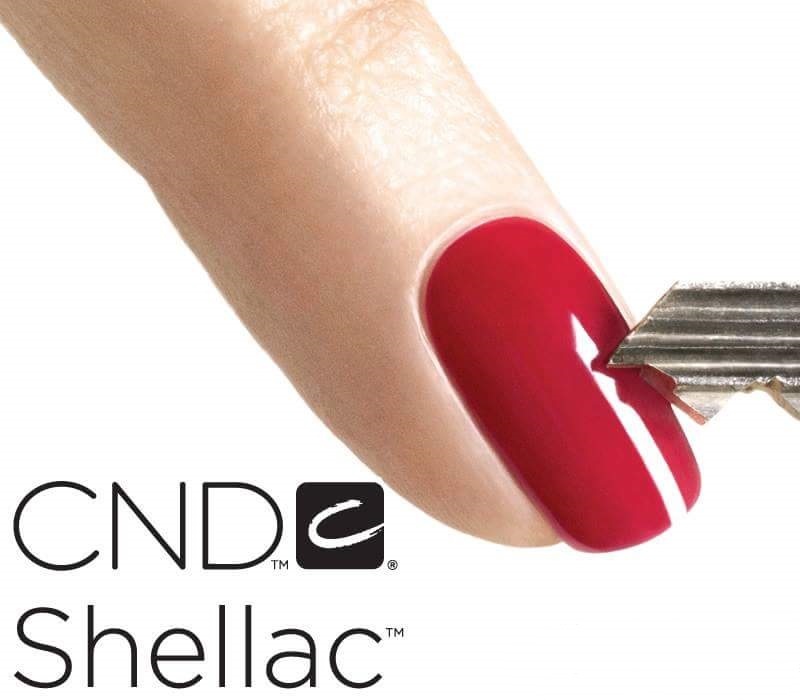 Weekly: Shellac Tuesday every Tuesday - CND Shellac Manicure for €20 (normal price is 30). Remove existing Shellac or optional French finish - €3 extra. Weekly Offer: See our website for our other weekly special offer treatments. Introducing The Manicure Company 14-day Gel Polish! We now stock a new range of 14-day Gel Polish(Shellac) Colours from the Manicure Company! 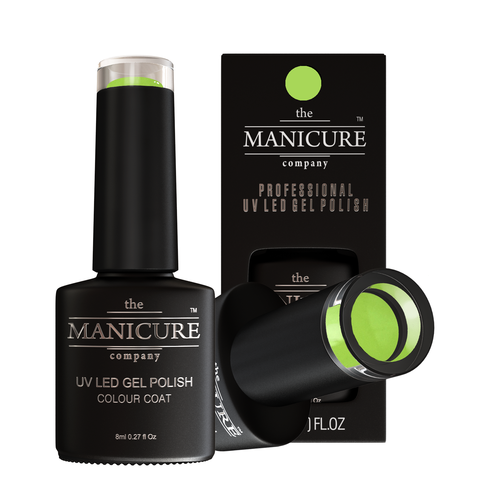 This new Gel Polish treatment is appllied to your nails, is ultra smooth, stong and long lasting! We stock a number of colours, with more coming soon! New Shellac Colection in Stock! 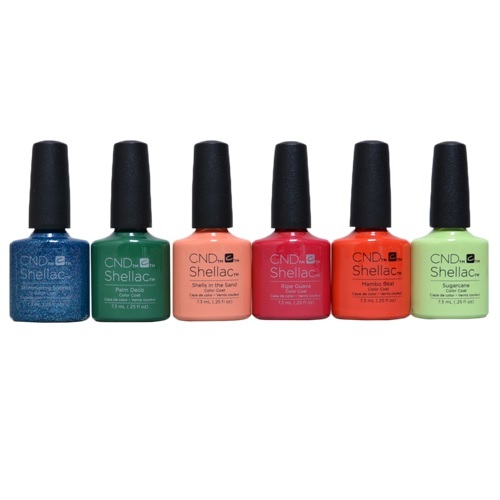 CND Shellac Rhythm and Heat Summer Collection now in Stock! The complete Rhythm & Heat collection inspired by the Tropics is now in stock in both Shellac and Vinylux colours. As of today, we have a new website! Whether you want to find out more about our treatments, check on the latest offers, visit our gallery or simply book your appointment online, our new website is easier to navigate, with a new layout and fresh exciting colours! And as always, you can also check us out, or get in touch with us on Facebook. CND Shellac is ONLY €20 ALL DAY!!! As always, we stock the full range of ALL CND Shellac Colours so you can choose your favourite colour or something new! 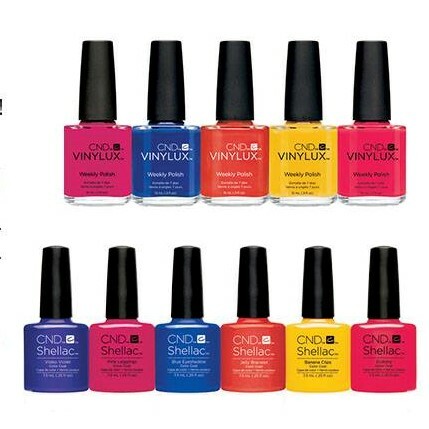 There are 5 exciting new colours available in both Shellac (2 week manicure) and CND Vinylux (one week polish). The new colours include: Video violet, Pink Leggins, Blue Eyeshadow, Jelly Bracelet and Ecstasy. We run a very generous loyalty card system - ask us for more details and for your free loyalty card on your next visit. We have always focused on providing the highest possible quality service so we only use the very best materials. We use the following brands in Nailbar Jervis. We are located on the 1st FLOOR in Jervis Street Shopping Centre, Dublin. We are situated at the top of the Henry street escalator opposite Penthouse Menswear and the Art & Hobby Shop. 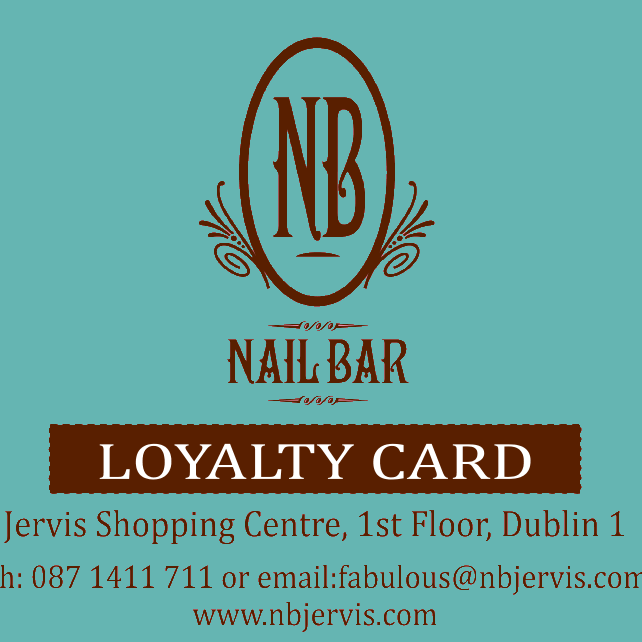 At Nailbar Jervis, we highly appreciate our customer's loyalty. To thank our customers, we have a great loyalty card system with no obligions. Simply, after 5 visits, your 6th is completely free! 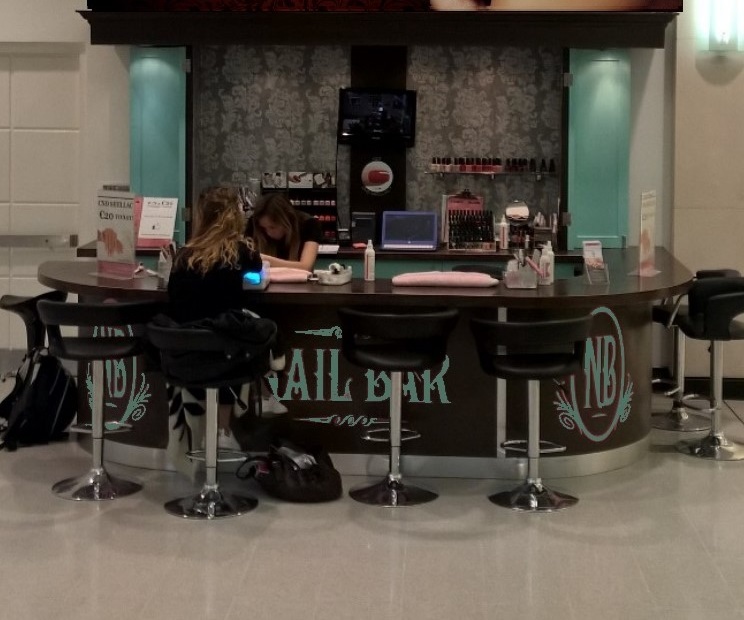 Are you a regular at Nailbar Jervis? If you have had your gels or gel refills done with us in the last 4 weeks, you get €5 off your gel refills. We pride ourselves on the high quality of our work. Our well trained and highly experienced staff use only the best quality materials to ensure we leave you satisfied with your nail treatment. Even with these best of intentions, sometime unexpected things happen, so if you have any unexpected problems/breakage* within 7 days of your treatment, please contact us immediately and we will do our best to repair any damage free of charge. Quality problems are rare, but when they happen we would much rather know so that we can attend them (and hopefully prevent similar issues in future). 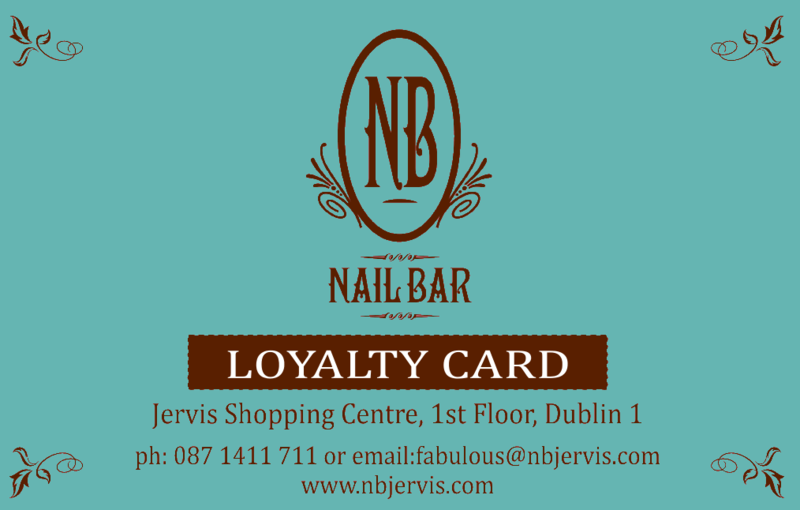 Contact us by email at fabulous@nbjervis.com or by phone on 087 1411711. * Our Warranty covers all breakages/quality issues not expected with normal use and wear. What can I do to make my nails stronger? Keep doing regular manicures is nice option to improve the state of your weak nails. You can also use cuticle oil or CND rescue treatment daily for the best result. Moistuized nails are more flexible, therefore less brittle and break less. You can apply nail strenghthener on you nails too. Is shellac damaging on my natural nails? No shellac is not damaging, there is not filing on you natural nails just gentle buffing to remove the shine before application. 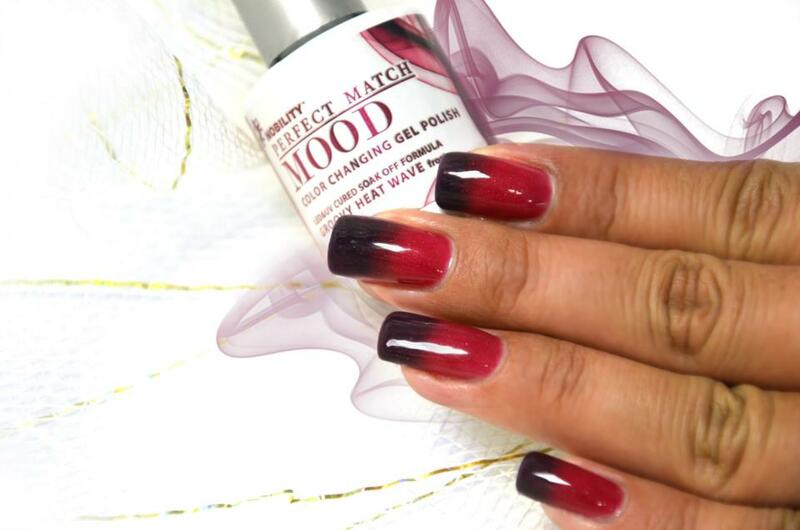 However if you are regular with your shellac applications we recommend to use cuticle oil as the removal process with the acetone might dehydrate the nail after certain amount of time. Am I getting cuticle work along with shellac? Cuticles are pushed back and also your nails are buffed to remove the skin attached to your nail plate as per mini manicure before shellac application. We don't apply any cuticle softeners as the nail plate would become too oily and the whole treatment might not last that well. For this same reason we don't recommend to combine treatment of full manicure and shellac unless you want to do them on separate occasions. Why not to cut cuticles? Cutting cuticle is popular for esthetic reasons, but is not a recommended practise. As well cuticles are there for protection against various infections , which can occur on you nail. Also cuticles grow back very soon after the procedure,so it is not serving well esthetic side of it either. Is shellac application recommended for weak nails? Yes it really is as the nail grow better underneath shellac, clients are usually impressed with amount of growth after is removed. There is a recommendation to keep them short when colour is applied. Weak and long nails can band at the free edge , which might cause unwanted breakage and chips. 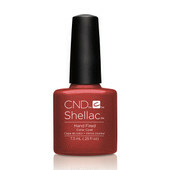 CND Shellac is the original, one and only Power Polish. It’s a true innovation in non-chip, long lasting nail polish! It dries immediately and removes with no damage. We carry the full range of CND Shellac colours for you can choose from over 100 exciting colours to suit every season! Your shellac manicure lasts up to 14 days days due to the the durable top coat which also give a mirror-like finish. As we strive to give you the best quality, we only use the very best material and tools from (and as recommended by) CND. Removal of Shellac only (with no new application) takes up to 15 minutes and costs €10. Watch out for our frequent SPECIAL OFFERS including Early Bird and Shellac Tuesday! 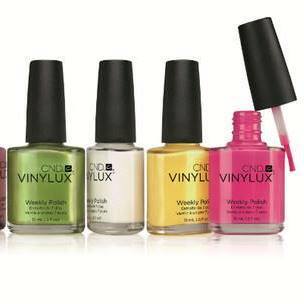 Get your favourite CND Shellac colour shades in CND Vinylux. We have a large selection of colours which are identical to CND shellac colours. 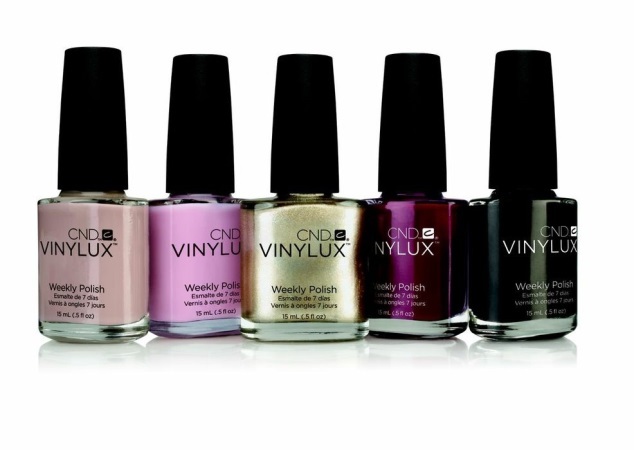 Vinylux appointments take 15 minutes to apply making them ideal if you are in a hurry and want your nails to look great. 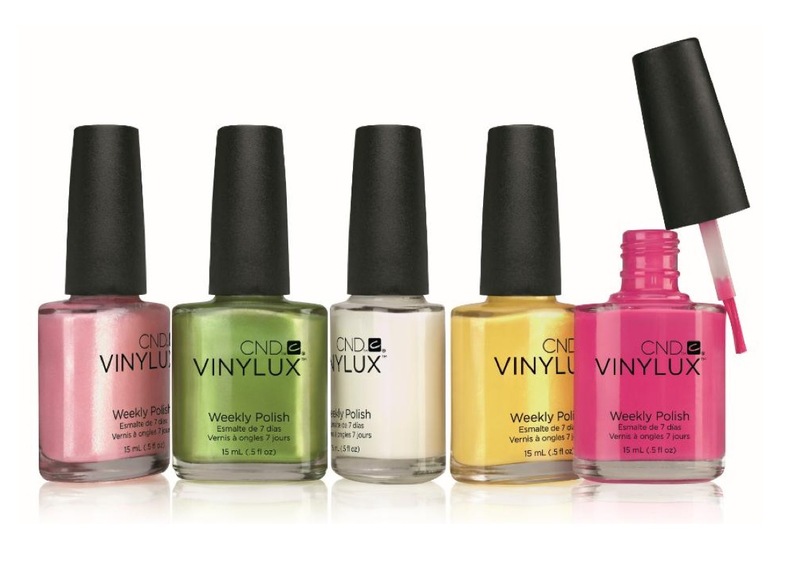 Vinylux appointments cost €15 and watch out for our frequent SPECIAL OFFERS. Vinylux lasts up to 7 days under normal wear which makes them stand out from other nail varnishes yet they can be removed like any other nail varnish. When at a constant temperature most of the colours will appear as a blend of two colours making your nails look unique. With this treatment you will definately have something different at your finger tips. This treatment taken from 30 minutes and costs €30 ?? Extension ? ?